THE Action Democratic Party (ADP), Lagos State Chapter has raised an alarm over what is described as death threat to the life of its Aspirant, Mr Babatunde Olalere Gbadamosi popularly known as BOG on a live TV Show by the spokesman of APC in Lagos State, Mr Joe Igbokwe. Gbadamosi was on Standpoint, a political programme on Television Continental (TVC) on Saturday September 1st, 2018 at about 1:30pm alongside two other discussants, namely Joe Igbokwe, the APC Spokesman for Lagos and Gloria Okolugbo, APC gubernatorial aspirant in Delta State where a series of questions were asked concerning Nigerian politics ahead of 2019. Mr Joe Igbokwe in his usual locquaicious manner interrupted BOG when a question about political development in Lagos and Nigeria were asked by the anchor. Instead of addressing the issues, Igbokwe jumped into name calling, blackmailing and assassination threat on Mr Babatunde. The ADP, in a statement issued by its Lagos State Publicity Secretary, Prince Adelaja Adeoye, called on the Lagos State Commissioner of Police Mr Imohimi Edgal, DSS, all the relevant security agencies, Sons and Daughters of Lagos, all residents and Lagosians in general to note the death threat issued by the APC against it's governorship Aspirant. The party said nothing must happen to Mr. Gbadamosi, his family and associates, or any of its members before, during and after the 2019 elections, that the APC should be held responsible for any breakdown of law and order in Lagos State, because they have started issuing death threats even before the commencement of 2019 Elections, perhaps because they can see the handwriting on the wall, regarding the impending defeat that awaits them. 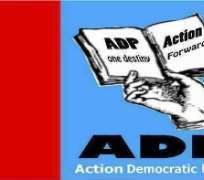 ADP stressed further that it is instructive to note that Mr Joe Igbokwe may have just let out the plans of his party against the opposition as the 2019 governorship election in Lagos draws closer. The party said that the notion by some certain political interests in Lagos that the assassination of the former PDP gubernatorial candidate in Lagos State, Engineer Funsho Williams who died in the most mysterious, controversial and gruesome circumstances, happened and heaven did not fall and will be wished away forever is just wishful thinking of those involved, and that Nigerians can now clearly see the direction of his death. ADP said its members are law abiding and would take all the necessary steps including legal means concerning this threat by the APC spokesman, Mr Joe Igbokwe. The party said that the defamation, malicious propaganda, libellous and false accusation against it's Aspirant Mr Gbadamosi, who never held any elective or nominative position in the PDP during his membership alleging that he ran away from the party after embezzling funds in the party for 16 years will not be treated with kid gloves. The ADP has challenged Igbokwe to quickly provide evidence or be dragged to court in the coming days. ADP said it would like to make it abundantly clear, demanding the public to take note of the activities of the political opportunists, miscreants and thugs who are ready to do dirty jobs for their benefactors, that all the politically motivated killings in Lagos will not be swept under the carpet inclusive of that of Engr. Funsho Williams, Dipo Dina and others. The party promised, as a leading opposition political party waiting to take over power in Lagos come 2019, to continue to set standards for all other parties in the State in terms of their political conduct, campaign and manifesto.